Good morning! 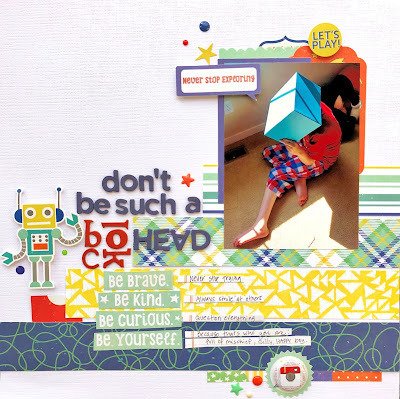 I'm sharing a project with Get It Scrapped , Paper Issues Pinspire Me challenge and A Flair for Buttons today. Titles are something I think we all had debates about. Does every page need one? Is it important? For me. the answer is YES! I love a good title. It's an entrance to my page. Check out the Get It Scrapped blog today as we take titles to a new level by talking about Title Orientation. This is when you play with words, letters or angles to add to your story and/or photo. The mood of the page is playful and I wanted the title to fit in with this too. Choosing a long title enabled me to play with font, color and orientation. I gave emphasis to the word 'block' by using a contrast color, red, using a serif font and finally by placing the letters into a square or blocked shape. Doing this ties the title directly to both the photo and the story of the page. In keeping with the playful mood, I chose PhotoPlay Boys Rule. In case you haven't noticed, I have a thing for bright colors. The energy of the patterns connects with the energy of my boy playing. The square headed robot sticker was a must use. How could I not? Lastly, to soften all the square lines in the page, I added some circles, particularly the camera flair. Reminding me its a photo moment. My son received a set of stacking boxes as a gift. His way of exploring and playing with them was to knock them down, then put them on his head. Then he's laugh and do it all over again. Thanks so much for stopping by my creative view today. 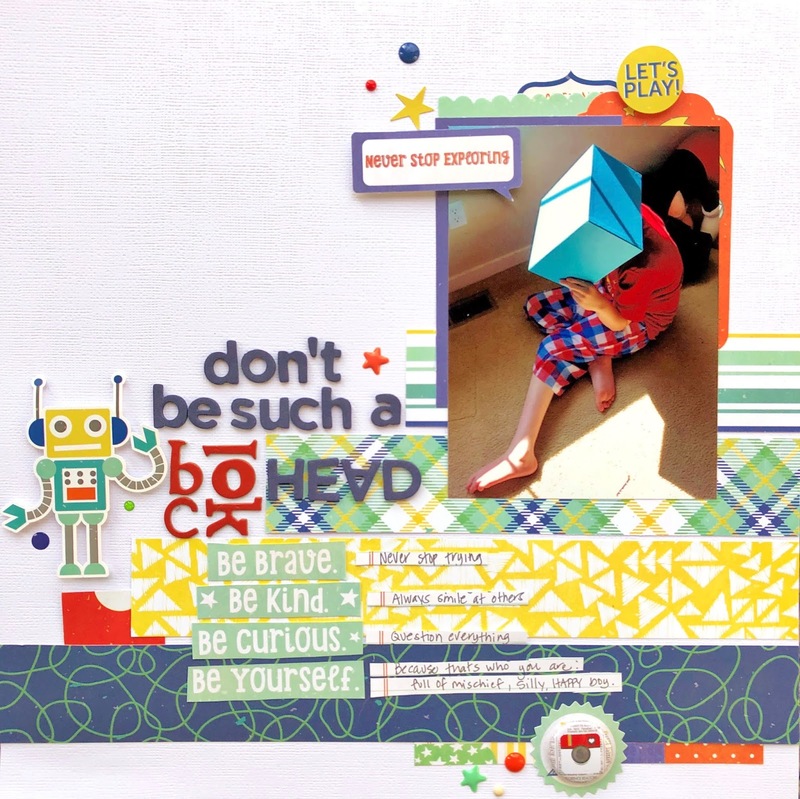 Check out the Pinspire Me inspiration in the Paper Issues Facebook group. Head over the the Get It Scrapped blog to learn more about title orientation, and everyone needs a bit of Flair on their pages!